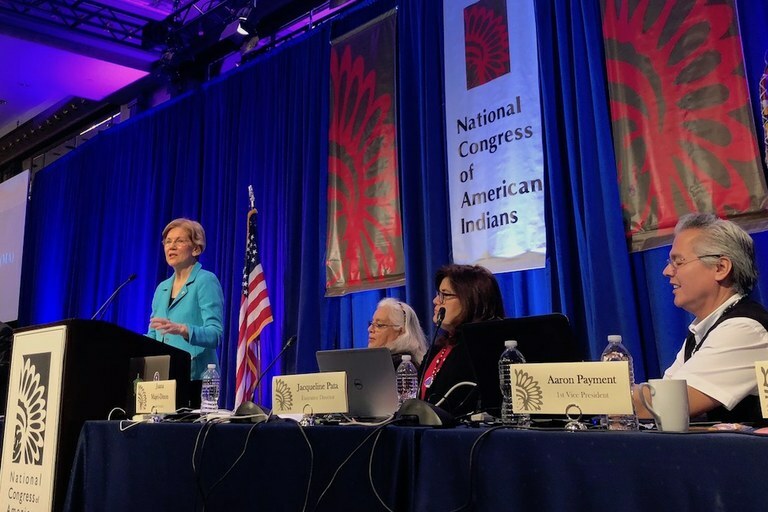 In a speech to the National Congress of the American Indian earlier this month, Sen. Elizabeth Warren, D-Mass., publicly addressed her claims to Native American heritage and the stinging criticisms of it that have dogged her for years. While many of the attacks on Warren’s claimed heritage have been vile, most notably the president’s insensitive nickname for her, an explanation from Warren was long overdue. Warren stuck to her story, telling the crowd her mother’s family “was part Native American,” even though “you won’t find my family members on any rolls, and I’m not enrolled in a tribe.” Warren avoided mentioning the Cherokee Nation, the tribe with which she has in the past purported to have lineage. Instead, Warren gave a detailed account of how her parents met and how they eloped because her grandparents did not approve of her father marrying a Native woman. Warren also promised to help tackle major issues facing Indian country. Sen. Elizabeth Warren made her first-ever appearance before the National Congress of American Indians on February 14, 2018. Warren’s speech received a standing ovation from the NCAI, but many Natives still think she has a long way to go to make up for unfounded claims and years of silence. At a certain point, however, the whole endeavor of substantiating Warren’s claims makes me uneasy. Native ancestry is complex. Our oppressors meticulously documented it, and it is scrutinized and quantified in a unique way in this country. I am routinely asked about my blood quantum, a strange and personal question people often seem comfortable asking and attributing to my capacity to speak on Native issues. I don’t relish the idea of scrutinizing anyone’s heritage, let alone Warren’s. But Native ancestry is something many white cultures see as exotic or novel, and making false, unfounded claims to that lineage is damaging. It makes us, as unique tribal communities and as individuals, not only seem like relics of the past, but it also relegates our culture to someone’s fantasy or to a box to be checked on an application. But there is something equally as disappointing as any claims Warren has made, the benefits she may have gained as a result, or the broader misconceptions they may have fostered: the fact that in terms of having a voice in Congress, Warren is the most influential lawmaker Natives have. A Native woman has never been elected to Congress, and the number of Natives elected to statewide offices has always been very slim. Even if Warren holds true to her word, to push Indigenous voices to the forefront and help build up those communities through things like expanding federally protected lands important to tribes and strengthening the laws that punish violence against Native women, she still has a long way to go, in terms of action and trust among Natives. Warren also said she never used her stories of family heritage for gain. While Harvard did once tout her as a Native faculty member, superiors note it had no bearing on her hiring. With all that, though, there were still positive aspects to Warren’s speech. She directly linked problems facing Indian Country to the rippling effects of genocide and generational trauma that Indigenous peoples have endured, a correlation not many lawmakers acknowledge. She alluded to the marginalization of our voices, and highlighted issues like redlining and the lack of broadband internet in Native communities. And, while I’m sure a room full of Natives doesn’t need a refresher on Pocahontas’ past, I don’t think that was Warren’s point in revisiting that distorted history. By taking the focus off herself, Warren publicly highlighted the sexual trauma Pocahontas’ story illustrates, and she put a human face on a historical figure that many people, including the president, have perverted for generations. Note: This story has been amended to more accurately reflect Warrens claims and Harvard’s position on hiring Warren.